This is a very thick and plush rug. It looks great in my sons bathroom. 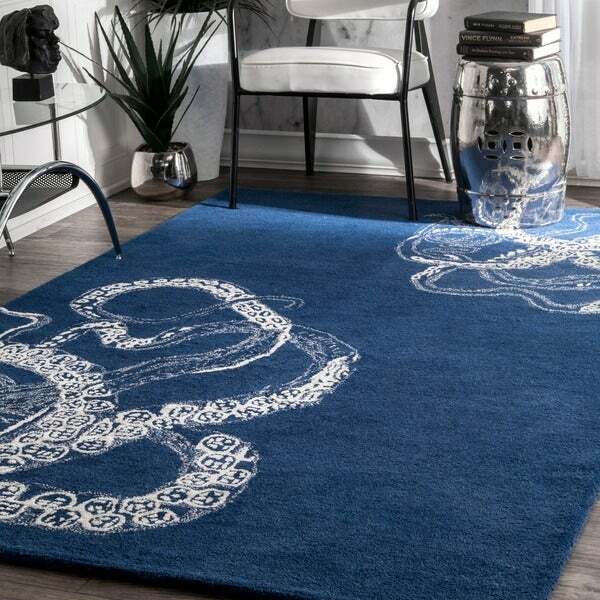 Beautify your home with this stylish handmade rug from nuLOOM. This exquisite indoor rug is crafted from a blend of wool and viscose to ensure durability and warmth. Dig your toes into the generous pile height as you relax and catch up on your favorite show or read a magazine. Available in a choice of lovely colors, this rug is a perfect way to add a modern touch to any space in your home. Eccentric, plush, good quality rug. Bought this rug in gray, and am very happy with it. The color is a charcoal gray, fairly dark and rich in color (not a light gray or silver). The octopus' tentacles are more ivory than white, with bits of faux silk woven into them. The gray appears to be just wool fibers with no faux silk in them. The pile height is great (0.75), and the rug is very plush.I was very particular about rug shopping with respect to pile height, because I wanted a rug that was soft underfoot and durable. I am very happy with this purchase, and the quality of the rug is excellent for the price. The purple version also looks like it would've been a really nice color option. First the pros: • The rug is beautiful! I chose the turquoise which helps brighten up an apartment with unfortunate taupe-y beige walls. • It is a lovely soft wool/faux silk and reasonably thick, but I think I want to add a rug pad. • Its aesthetics and "feel" are why I am giving it 4 stars despite the flaws in my cons section. The Cons: I• I'm going to be picky and note for you that it is NOT a rectangle as one of the short sides is a full inch shorter than the other! • It is NOT, in fact 7'6" x 9'6" but a couple inches smaller all around. While this sounds like not so much but when you do the math is actually 2 square feet smaller, which is somewhat noticeable. (Also since it is categorized as 8' x 10' if that is really the size you need, this is not the rug for you.) • The quality of the edging finish is not so good. It is a bit loose and makes me wonder how long it will last. (If you have pets which may paw at the rug, again this might not be a great choice for you) The Neutral • It sheds, as would be expected with a wool rug for its entire life. I just got a new shark vacuum and filled the canister twice with turquoise fuzz! I should note also that I also filled the canister once with purple fuzz from a 6' x 6' Alliyah scroll rug I bought from overstock about 7 years ago! Point being, if you want a nice warm soft plush wool rug rather that some of the polypropylene rugs that often look cheesy, expect the fuzz. This wool rug sheds a lot. I vacuum it 1x week to keep it looking good. I purchased the navy blue and b/c it is a dark, solid color, it does show lint and dirt quickly. Still, I have it in my home office and love it. I don't think it would be great for a high traffic area or a room with lots of kids or pets. I bought the plum and it is darker than I expected (but the "color" is exactly right, it's just dark, like very saturated) but honestly it just makes it look more 'quality', as well as making the pattern REALLY pop. Because it is so dark, it looks much better freshly vaccumed and/or avoiding tracking dust and dirt all over it. I have to admit it's been filling up my vacuum like crazy but I've had it for a few months now and the shedding is finally calming down. I vacuum once a week. Speaking of cats, it does not show cat hair too much (fur in this case being black white and grey) and has held up well with two cats kneading it with their claws periodically. The silk comes out once in awhile due to the cats but for the most part it still visually appears unharmed. The wool, if the catchs catch it correctly, sometimes looks a bit knappy but I just use scissors to snip the 1-2mm of wool which is sticking up a bit too high. It still looks brand new, because it is a very, very dense rug. In my opinion there is NO reason you should need a rug mat underneath. The pile is thick and the cotton backing and heaviness means it has never scooched on me at all. This is a beautiful rug. It's way better quality than I expected. The weave is lush and packed and the color is pretty. I got the natural color. My only regret is that I didn't buy the larger sized rug. Purchased this rug for our vacation home. This is a thick and luxurious wool rug. The color is very vivid and the design whimsical. A perfect addition to our Florida vacation home! We love this rug. Had it for years. High quality wool and "faux silk", but, honestly, is great quality &amp; feels great on your feet. Heavy rug, great nap. Color was exactly as promised &amp; shown (we got the blue) and the octopus graphics are gorgeous and not cheap looking. Yet, subtle - as we have under/around our sectional seating. Easy to spot clean as well as carpet shampoo. A bit of fading after 5+ years of having it where the sun consistently hits it. I don't know why but this carpet attracts so much dust. I am vacuuming it all the time. It reminds me of when I had a black car and it was always looking dirty. Other than that I have no complaints about the rug. Be sure to look carefully at the print in the photo. You have to really like the design or you won't like the rug. I am actually looking in to how to return this garbage. After over a month of almost daily vacuuming, it still sheds so much that my entire canister is full of turquoise fibers. The white of the rug is starting to pull out to the extent the fiber ends are exposed. It is a beautiful rug, but the quality is poor. I'm very disappointed in the shedding and unraveling. This is a deep grey which in our lighting has almost a blue-grey look. It goes perfect with our light Tiffany blue couches in our formal living room with our reef saltwater tank. Sheds a bit in the beginning but holds up well with foot traffic. If you have hard wood or tile floors be sure to get a rug grip pad too. The color is vibrant and the graphic is clear and gorgeous. This is a well-made, thick pile rug that is super soft and comfortable to walk/sit on. Only drawback is the constant shedding (have had it 1 month), but it's worth it! The rug is beautiful! We purchased it in purple and it is exact colour that the picture indicates online. Also, the octopus design is tastefully done - kudos to the designer! It does shed some, but I noticed most new rugs will do the same so that is not a deal breaker for us. We highly recommend this rug if you're searching for something unique for your space. sheds, and loses a lot of fibers when i vaccuum it with a dyson. a vaccum that uses bags may be better to use . Bought this rug over a year ago. It's sheds constantly. And it sheds a lot. So much that our normal vacuum clogs with the shed fibers. I had to buy a sweeper just to clean the rug. The white fibers are poor quality and inconsistent widths. They stain quickly and begin to pull out. Now several white patches look like strung out yarn. The only way to clean this is to pull out my steam cleaner. I'm currently looking for a rug to replace this one. Great quality rug, but the color is not the same as pictured. I expected the color to be gray but instead received a slate blue. Ended up keeping it and even years later it barely shows any wear. And we have a dog! We love the look, color, feel, pattern, and texture, but...the other reviews are right, it sheds a ton. The tufts pull out easily (I have a cat), but it seems to hide the pulled out threads well. Be warned though, the care instructions warn not to use a vacuum with a beater bar and it is hard to keep lean with just suction. Beautiful rug! Unpacked it about four days after I received it and it rolled out beautifully and laid flat immediately. Adds a fun design element to our family room. We did not have any shedding issues, as some others have mentioned. I'd buy this again. Cool rug but it did not wear well had to replace it after a year. Unfortunately, like everyone else is saying, the GRAY color is actually a MIDNIGHT BLUE. This is what it says on the packaging. As our house has no blue and I really was hoping it would be a LITTLE GRAY, sadly, it is not. It is a beautiful shade of midnight blue and for the right house, this is an INCREDIBLE rug for the price. The rug is very plush and feels wonderful under your feet. So far, so good (it’s onky been about a week though). We bought the light blue option and I think cirrulean would be the best way to describe it. It does shed a lot when vacuumed, but I don’t mind it. Our cats love it too. It’s thdir new nap spot. This was a little bit of a risky choice for me. It is okay. The edges are not perfectly round in places, but not too bad. I got it for a guest bedroom which has a marine theme to a certain extent. It sets on wall to wall carpeting that is off-white Berber and definitely provides some 'mood'. I think I paid *** for it which I now feel was perhaps *** too much for what I got. "Is this rug grey and white? Other websites have conflicting color descriptions." "What is the faux silk made of? And what are the proportions of fibers? " 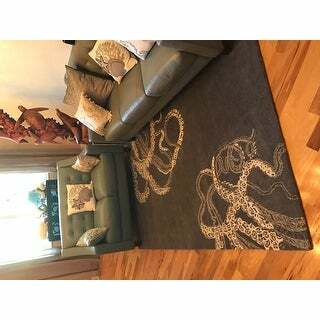 "Do you have the grey octopus rug in a round size?" "Is this rainbow color octopus available in round?" "Is this a true 4 x 6? Or measurements less?" All rug measurements are approximate. "it says indoor/OUTdoor...but none of the pictures show it outdoors...is it really something you can put outdoors?" No I would not put this carpet outside .. It is thick wool would not do well at all. Hope this helps. The Rug is an indoor rug. "The color shows blue. Is it an aqua or bright turquoise with white or ivory? Thank you." In my opinion, this rug is turquoise with white detailing.